Abdullah contests Afghan poll result Jump to media player Afghan presidential candidate Abdullah Abdullah has claimed victory in the country's disputed election despite preliminary results that put him behind his rival, Ashraf Ghani. Afghan presidential results announced Jump to media player Ashraf Ghani has won 56% of votes cast in Afghanistan's presidential election, according to preliminary results. What is ordinary life like in Kabul? Jump to media player The BBC's Bill Turnbull has been meeting residents of the Afghan capital Kabul to see what life there is really like - and if it is any safer. Inside Afghan election count centre Jump to media player Karen Allen reports from inside an Afghan election count centre - and looks at the issues the next leader will have to tackle at ground level. 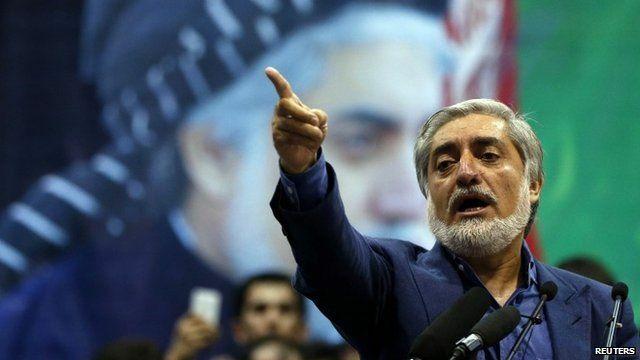 'Vote-counting should be stopped' Jump to media player One of the candidates in the Afghan presidential election, Abdullah Abdullah, has demanded an immediate halt to the counting of votes, following allegations of fraud in a run-off poll last Saturday. Afghan presidential candidate Abdullah Abdullah has claimed victory in the country's disputed election despite preliminary results that put him behind his rival, Ashraf Ghani. Addressing a rally in Kabul, Mr Abdullah described the vote as fraudulent and said he would not accept defeat.